Oh my, now I have another challenge. This puppy just got dropped off. This one is not from our lines, but the breeder knows the only chance the pup has is with me. I have a reputation to be able to save these pups that are born very premature in development and small for gestational age. 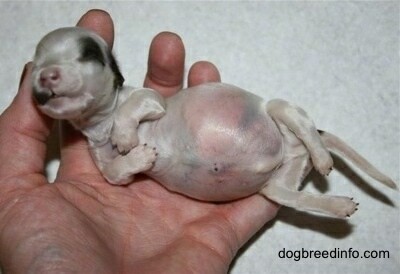 Many litters produce a runt or an underdeveloped puppy. 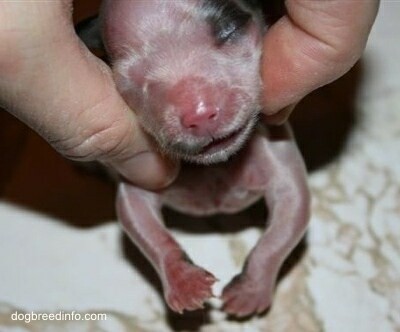 These puppies seldom survive and die, as they need human intervention, like a premature baby needs NICU to survive. 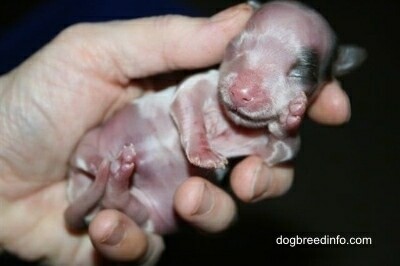 Most breeders do not have the time or the knowledge to help these little ones, and unfortunately they die. Most vets are not trained in neonatal care, and are of no help to desperate breeders that would like to help their little runt survive, and then there are some breeders that have the belief that if the pup cannot survive on its own, then it should be let go. They dropped off a dam and two newborn pups. 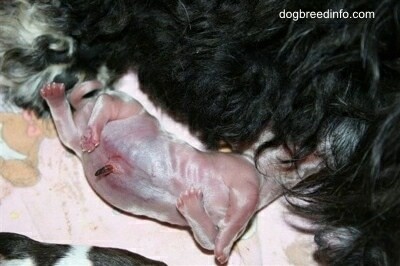 One pup is very, very premature in development. I will raise him for a few days, tube him and see how it goes before I send him back. He looks deformed on the front legs, and has hardly any hair. The balder they are, the earlier they are. He is pooping and peeing, so his plumbing is working; a good sign. This pup is very premature in development compared to his sister. This pup needs tube feedings and to never be allowed to fall below birth weight He also needs HEAT… lots of warmth. We are not sure if his front legs will straighten out or if he has a deformity. 2 Days Old—At two days old the preemie is still at birth weight, 100 g. The dam has LOTS of milk, so I am expressing 4 cc of milk from her teats and tubing him with the dam's milk. I am giving him 3 cc every 2 to 3 hours. 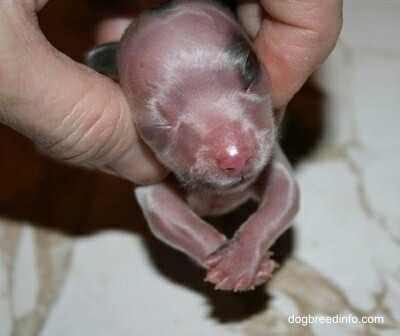 Sadly, this puppy died on day four. 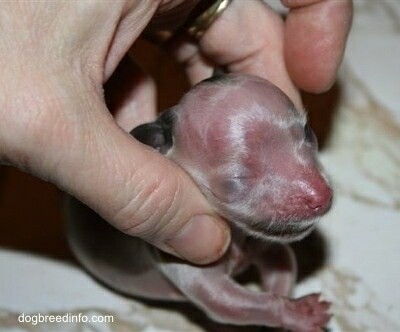 Often at about four days old fragile puppies bloat up and die. This is hard to avoid. Heat, antibiotics and sub-Q fluids are needed, but this pup was so very underdeveloped. We only gave him a 25% chance of making it and sadly he did not.